I loved the clothing that came with her. My word, the quality is amazing... and that's coming from me, the most persnickety doll sewist ever. I will obviously be drafting new patterns for her, and to start, I've gone for one of my favourite pieces of clothing, the leotard/bodysuit. So here's the new leotard. It's my second draft of the design and is still a tad too tight. I hand painted the heart motifs, and the leotard stretches them out of proportion a bit. I'll correct that on my next attempt. I like my bodysuits to follow the natural curve of the doll's modelling. By that I mean where the body section ends and the thighs begin. It's looking very good shape wise. And the waist is not bagging out at all in the back. The jeans she comes with are soooo tight. I must make some that are just a bit looser, so I can get stain-preventing tights on underneath them. They do just go over the knickers she came with, and hence work the same over this bodysuit. The tightness of the jeans also rules out any seated poses. So I'd really like to make some that accommodate movement. I just love her. And have been carrying her around the house with me. She has loads of attitude. I've ordered some Lycra fabric with one of my own print designs that'll suit her perfectly! I'll be enjoying sewing for Cass for a bit. There will be patterns eventually, but first I want to nail down some basics for her. Leotard, tights, leggings, etc. 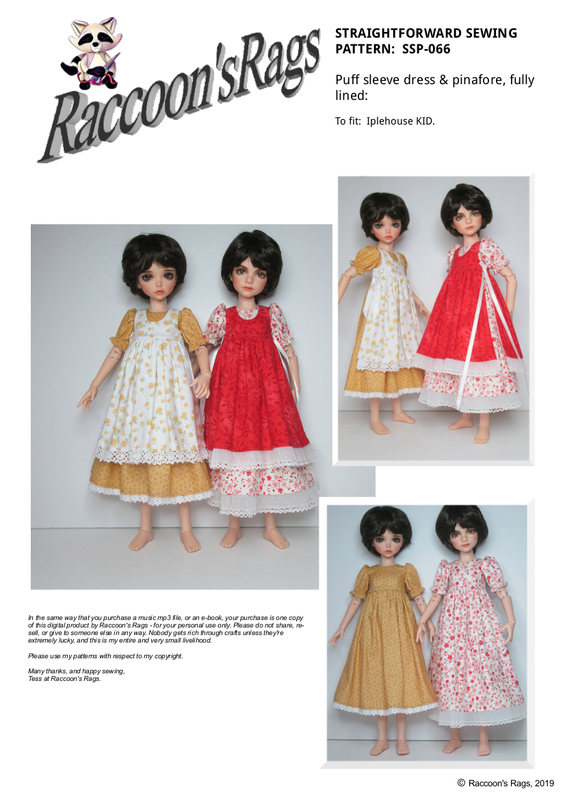 I have the free Smart Doll patterns available on their website, but prefer to draft my own. I'm all booted out now. I've designed and made these loively little fleece lace up boots for Kaye Wiggs dolls. All the girls, MSD, Tobi, and Nellie are catered for here. I don't know about the Laycee body which is more substantial, as I don't own that doll body. 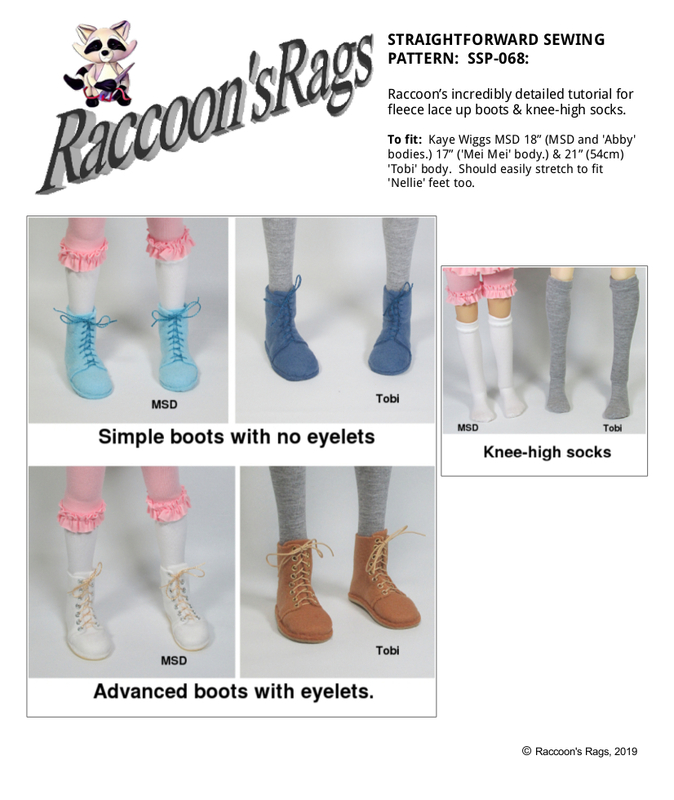 So Raccoon HQ presents another lovely and highly detailed tutorial on how to make boots. There are also socks, for protecting your doll from any potential staining from dark or deep-dyed boot fabric. Then there are the more advanced boots, which have eyelets and a glued on foam sole. I've included some variations on the boot making, as well as a section at the back, which is a detailed tutorial on how to sew back stitch. Hand sewing is essential when making these, but all the seams are small so it's not too time consuming. I'm used to making these now, and can make some in a couple of hours, entirely by hand. I have been away for a long old time. My lovely housemates offered me the largest room, seeing as I was in the smallest and having to run my business from there! The new room is twice the size, and I've incorporated a ton of storage into the furniture, shelving, etc. it will house all my too-many dolls, and my too-much fabric! I just have to make sure I don't expand too much now, and end up with storage space troubles again. Easier said than done for us fabriholics. 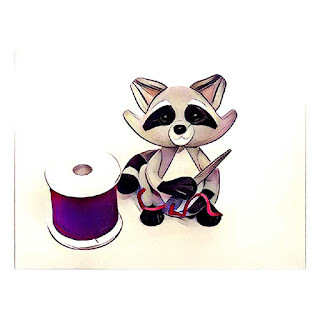 I'll try to post some photos of the new Raccoon HQ soon.